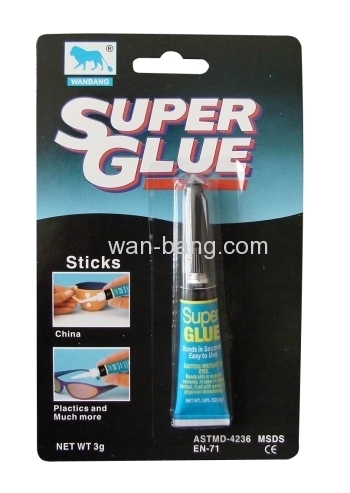 "Wan Bang" superglue is a transparent reliable cement. Bonds in seconds on the surfaces of metal, most plastics, wood, leather, ceramic etc. 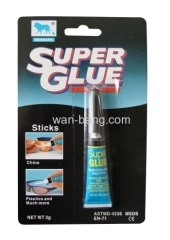 Adhesive purity has 99.9% and 50% which reflect on prices. Guarantee shelf life two years from manufacturing date. Natural type, no harm to environment. Five sets of caps and tubes are available for your selection. Own controlled factory of aluminum tube supplies high quality tubes. To ensure air tight to prevent solvent evaporation, with sealed end. Aluminum tube can be dated code. Pack with blister card or print box.